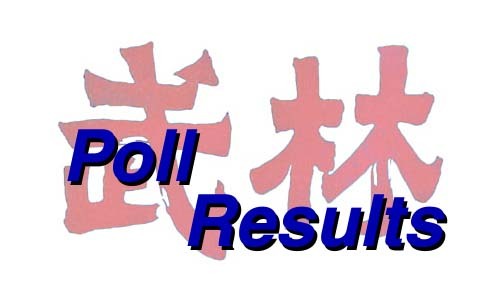 This is a listing of the results of past polls, the poll can be found at the top of the Debate Zone page, and will change every few weeks. Are you going to Collegiates Nov 9 2002 at UC Berkeley? Which locale would you prefer for the 2003 World Games? If you could travel to any city for a good national level wushu competition, which would it be? All Visitors, please answer this question, tell us who you are! Are you planning on going to the WKF Nationals in San Diego in October? What was your favorite part of Shanghai Noon? What do you think about Jet Li's latest, Romeo Must Die? Are you going to Collegiates this February 12th at Stanford? Do you feel Wushu Athletes have the right to be involved in the decisions of their National Wushu Federation? Did Hong Kong do better than it should have at Worlds? Are you going to the World Games in HK in November? What is your favorite part of wushu class? What is your favorite 'Other Weapon' to practice? How many students in your wushu class? How many times a week do you practice?